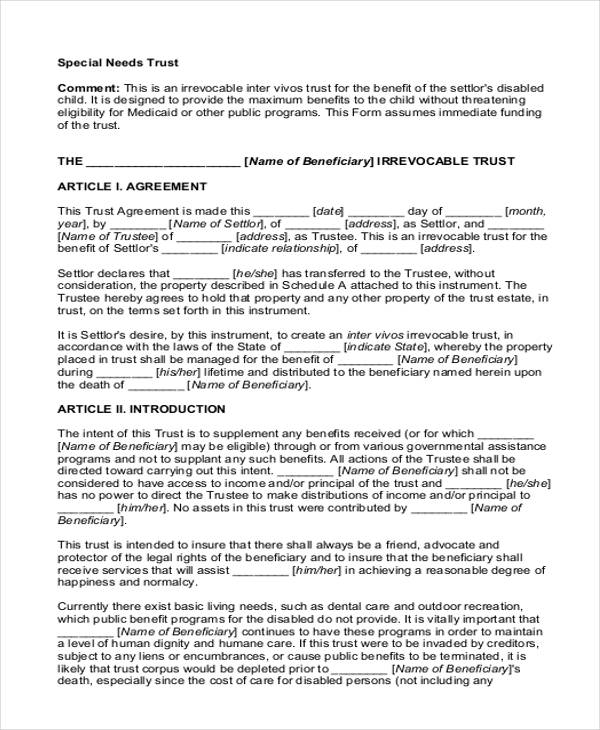 The will and trust form is a very crucial estate planning tool. As an estate owner, you must have planned for the distribution of your property and assets and you need such a form to declare that formally- so that there is no risk of unwanted claims on your estate. A will is something that takes into effect after the grantor expires but a trust will come into effect from the point it is framed, even when the grantor is alive. If you need a clear understanding of the different terminologies of a will and trust form, this form would be useful as it comes with neat definitions of each of the major terms used in such a form. 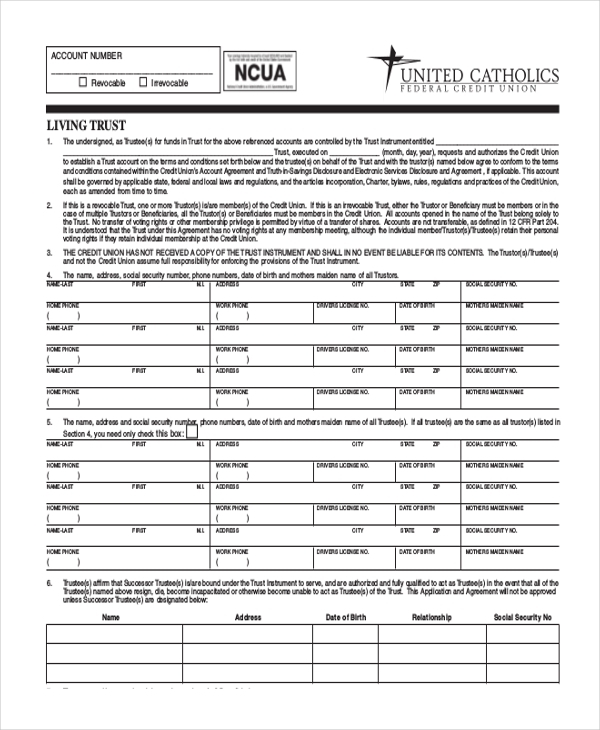 You not only have a living trust agreement here but prior to it you also have a guide that explains all the different sections constituting the form so that you can have a proper hang of the entire thing. 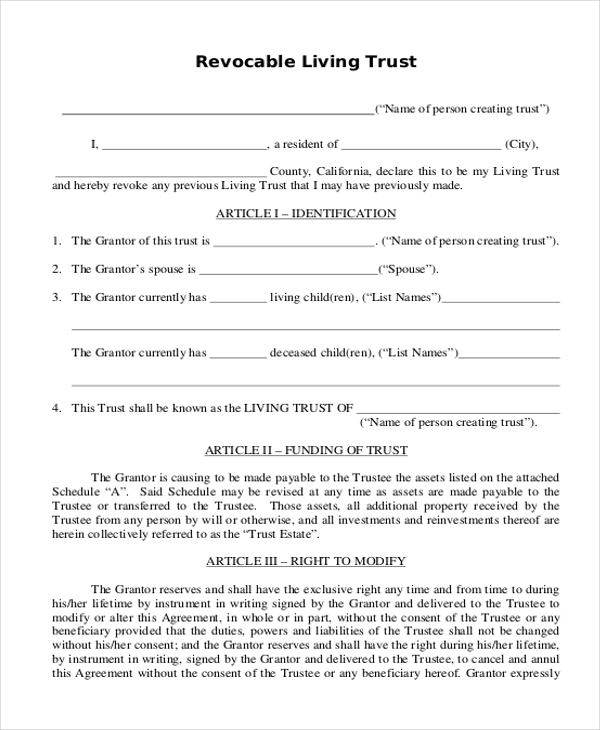 This living trust would be useful when the grantor wishes to revoke any trust made previously and want the current one to be the actual trust. It also contains an explanation of different parameters of such a trust. 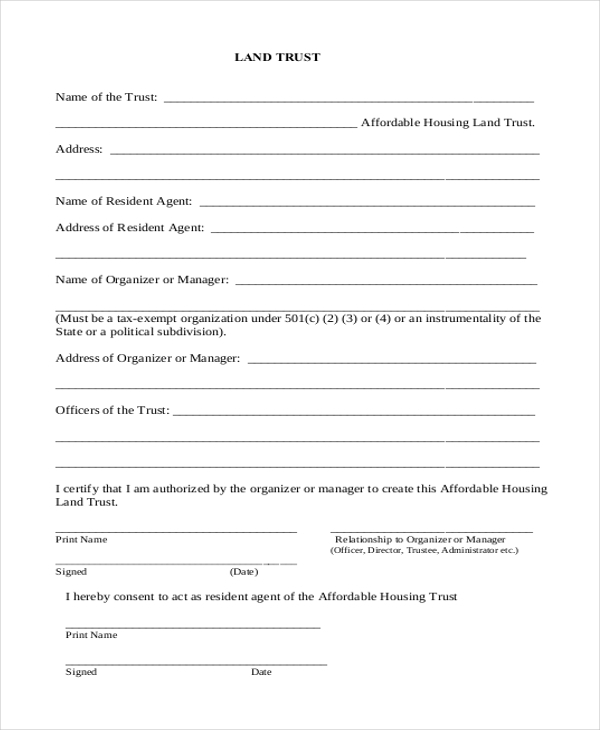 You have a detailed affordable housing land trust registration form here that includes all the major sections needed in such a standard form of information on the resident agent, organizer or manager, officers of the Trust. 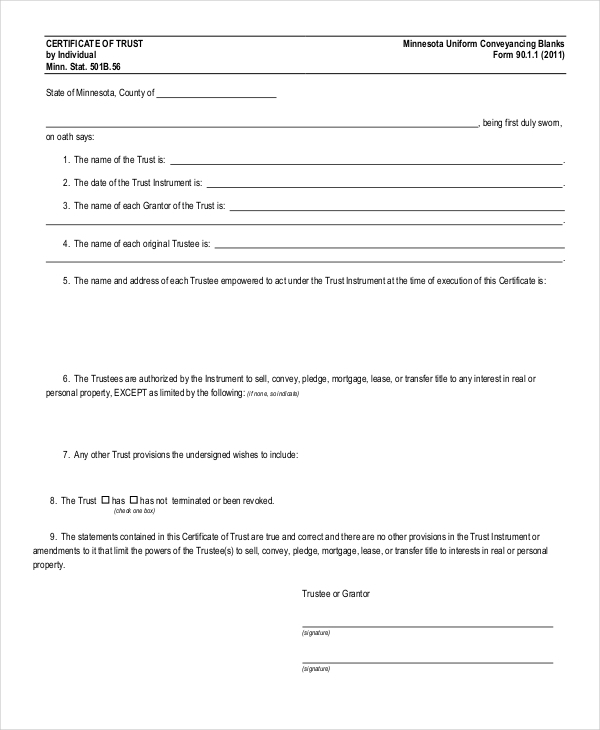 This land tax trust form begins with a brief introduction of the form followed by a sample form stating trust details, particulars of the notification, details on the beneficiary, declaration of the trust etc. 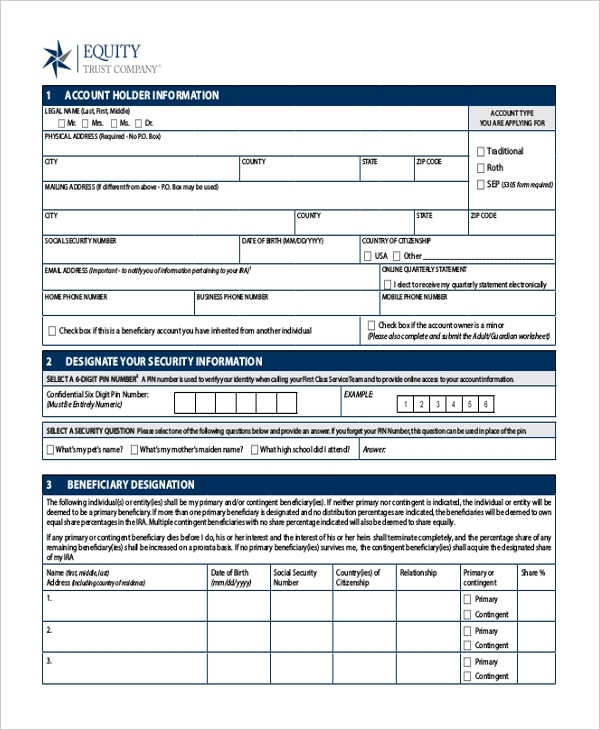 This form is in regards to the administrative proceeding of an equity trust company before the Securities and Exchange Commission. It starts with the summary, which is followed by procedural background, allegations, and arguments of both parties etc. 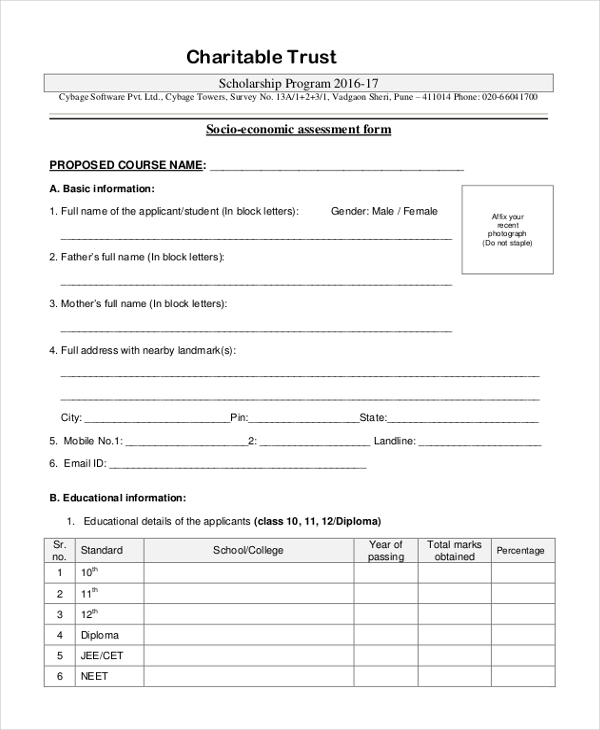 You have a socio-economic assessment form here which will assess the socio-economic condition of a group of students. It starts with basic data on student, followed by educational details, family information, income source etc. 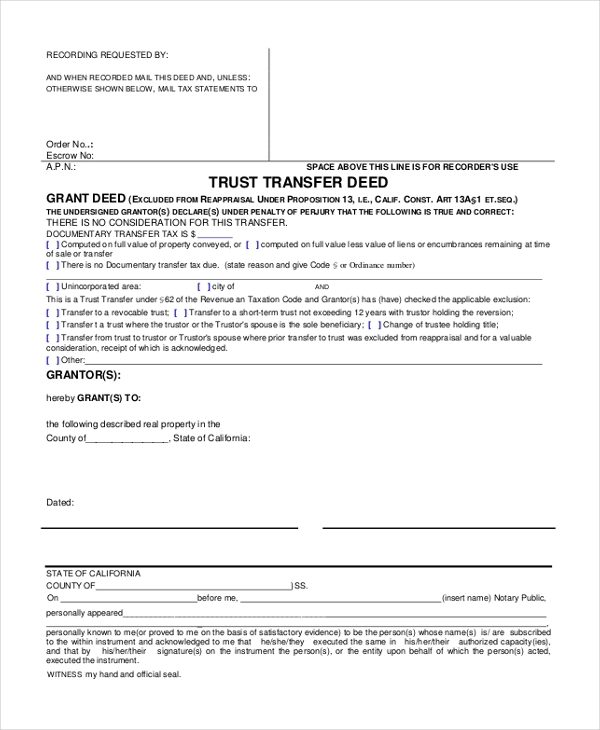 This trust transfer deed would be useful when a property owner wishes to transfer his property to a family member. 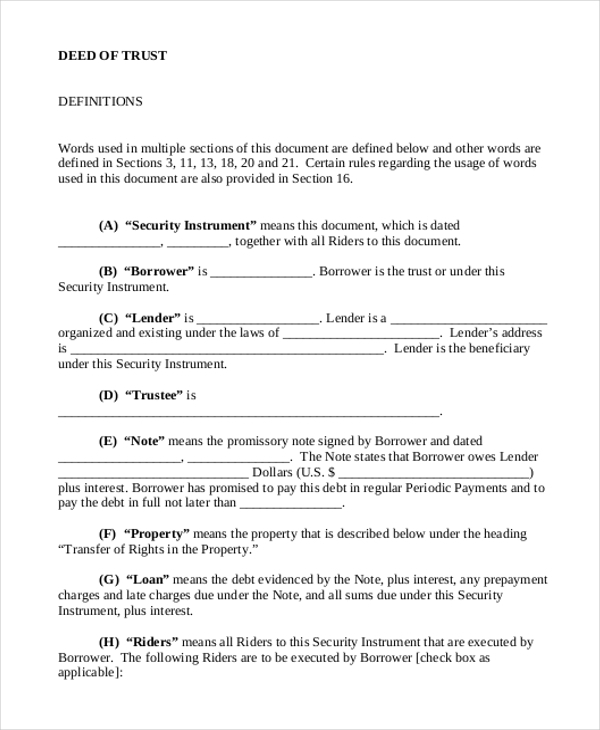 The form identifies the grantor and the grantee and offers legible space for describing the property. 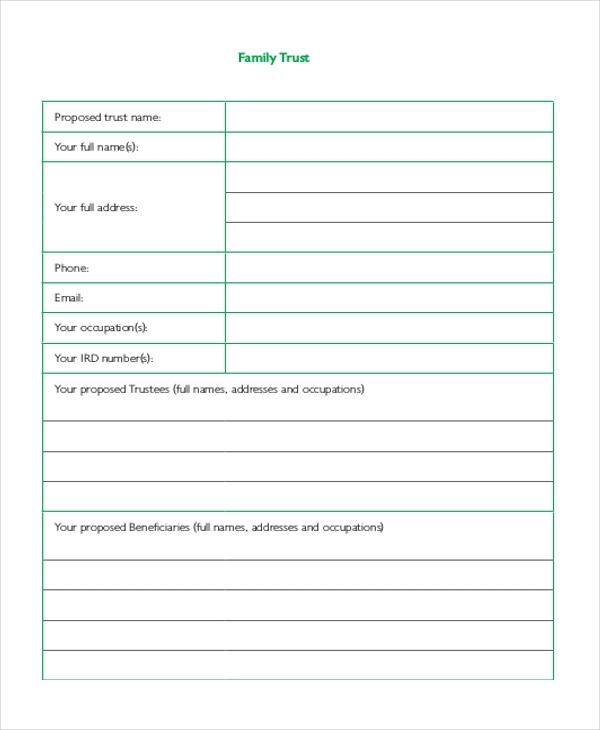 This is a very useful family trust form which contains anything you want to know about Trusts like their importance, needs to protect your home (explained with short stories), the entire process and so on. If one has to create a trust for his disabled child, then this trust is the one-stop solution for him as it is specifically designed for such a condition. It’s an elaborate form with all the standard sections of such a trust. This certificate of trust form begins with the declaration of the trustee about his confirmation of certain facts that are listed below. The form concludes with notification from the notary. You have a professional deed of trust form here which commences with certification from the grantor that he is granting all beneficial interest to the beneficiary and you have sizeable space to describe the property. 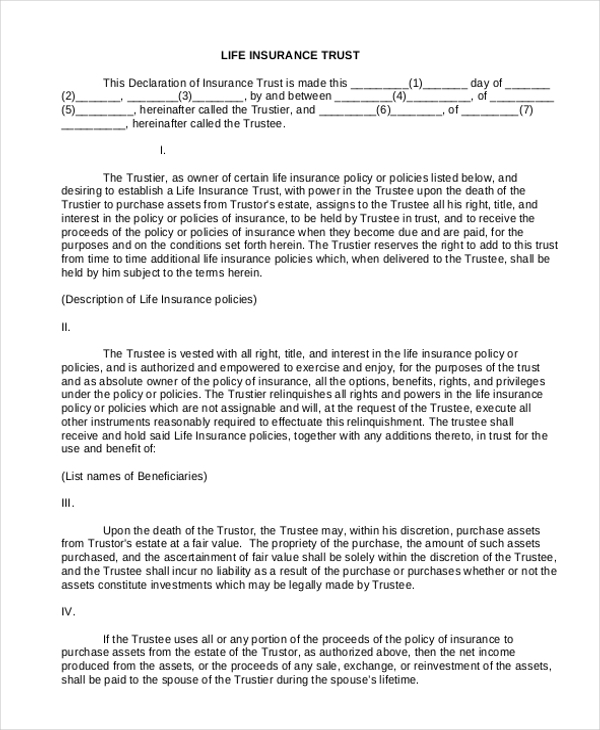 You have a standard life insurance trust form here which commences with identifying the trustier and the trustee and then goes on to detailing the rights and powers of both the parties. 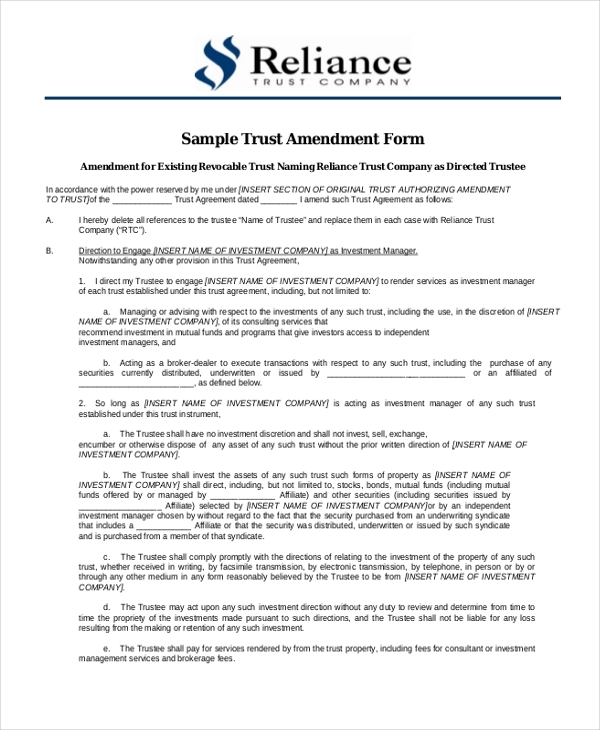 This trust amendment form would be handy when you have to amend a previous revocable trust. The form carries all the clauses that are standard in the trust amendment forms. 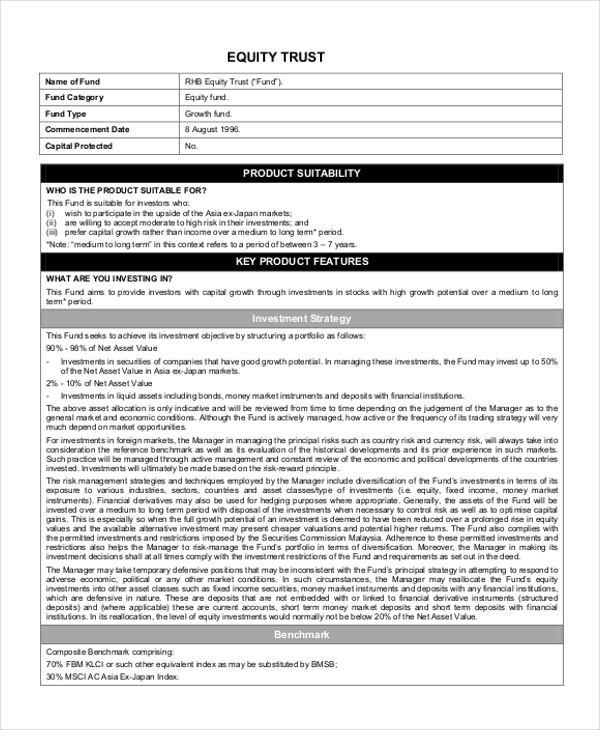 You have an elaborate equity trust form here that commences with responsibility statement, followed by disclaimer statement and then you have a lengthy product highlights sheet- with data on product suitability, key features etc. What is the Importance of Will and Trust Form? The primary importance of will and trust form is that it helps you to specify what you wish to do with your estate so that there is no confusion regarding the property and assets when you cannot be present. On one hand, it helps to protect the property and on the other hand, it eliminates the issues of unwanted claims on your estate. Besides, if you have a disabled family member, you can ensure a solid protective solution for him or her that would take care of the person in your absence. What are The Mistakes to Avoid in Will and Trust Form? One of the common mistakes to take care of here is the failure to extend explicit instructions regarding your assets- i.e. how they would be distributed or invested and so on. Without such details, your beneficiaries might have to face legal obligations. Then, do not commit the mistake of vague identification of your beneficiaries in your will and trust form. Any problem here can mean deprivation of the actual beneficiary of your trust. Besides, improper selection of trustee is another big mistake you must be careful about while preparing the trust. 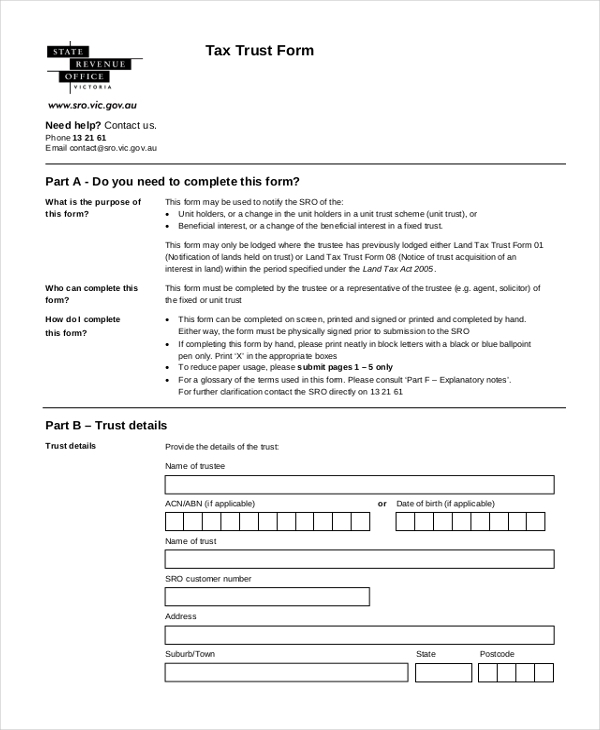 Creating a will and trust form is a serious thing and if you need guidance here, the templates mentioned above would be really useful for you. 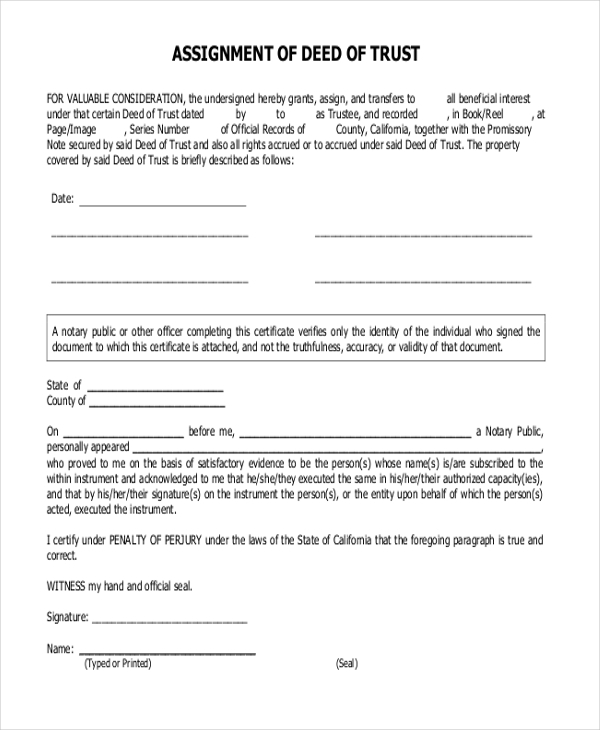 These templates not only offer readymade trust forms but some of them have even extended explanations and information regarding a trust and various aspects of it.